Up to A1 Printing. USB and Parallel Connections. We will always go out of our way to source the product you are looking for. 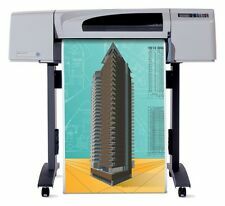 Print up to 85 square feet per hour. Add to Favourites. Built in Auto-cutter. The plotter was serviced on 28th September 2018 and showed a total number of prints from new of just 42 - therefore this plotter has very little use since new. The plotter is 1050mm in height on it's stand and 1770mm wide. Bought this printer a few years ago for a project. The last two images depict a few of many large drawings that I printed with it. This is a voluminous and heavy item. You are free to arrange for the printer to be picked up. Canon iPF pro-1000 large-format printer/plotter, A2 format, 12-color system. Modell iPF Pro-1000. A great way, impressive pictures borderless up to format DIN A2 without having to print quality loss. Make: Printrex. Model: 812. Supplied as pictured, includes partially used thermal paper roll. Connectivity: USB. These printers can connect directly to either 12-volt or 24-volt vehicle power systems. Print up to A1 size. USB & Ethernet connections. Print up to 445 sq feet/hr. We will always go out of our way to source the product you are looking for. Add to Favourites. MAIN PCA BOARD FOR DESIGNJET 5500 (ALL MODELS). REFURBISHED MAIN PCA FOR. Compatibility: Designjet T520. Multifunction Printers. Inkjet and Photo Printers. Laser Printers. Dot Matrix Printers. Wireless Networking. Images for illustration purposes only. Other Drives and Storage. Q6709A HP DESIGNJET T1100/T601 44" SPINDLE - Q6709A (Printers > Plotters Large Format Printers). Multifunction Printers. Inkjet and Photo Printers. Laser Printers. Dot Matrix Printers. Information technology professionals rely on HP quality to ensure maximum productivity. For which you must use the program to restart and continue using the plotter. It also has other maintenance and utility options for Plotter. Service Program Plotter_. Para lo cual debe utilizar el programa para reiniciar y continuar utilizando el plotter. Vinile Avery Dannison, e Ritrama RI MARK sono il top della qualità. Tipo Plotter. 70 micron thickness, high quality performance. PROFESSIONAL PVC VINYL. 1 ROLL VINYL STICKER COLLECTION. For which you must use the program to restart and continue using the plotter. It also has other maintenance and utility options for Plotter. Para lo cual debe utilizar el programa para reiniciar y continuar utilizando el plotter. 9700, 9890, 9900. For which you must use the program to restart and continue using the plotter. It also has other maintenance and utility options for Plotter. Service Program Plotter. Para lo cual debe utilizar el programa para reiniciar y continuar utilizando el plotter. HP DesignJet 330. suitable for this printer and plotter HP DesignJet 350C. HP DesignJet 430. HP DesignJet 450 c. HP DesignJet 750C plus. HP DesignJet 750C. HP DesignJet 455CA. HP Designjet T610 44'', 1118 mm, plotter, untested, with ink, pickup only. This item has been switched on but it doesn't seem to boot up properly and shows a 08:11 error. In good cosmetic condition but untested. We are open to offers on this item, but please bear in mind that this is Collection only and we cannot ship this item. Further information: ---Turned on, but not fully tested. ---Item comes as seen in the pictures, with the UK power cable - no other accessories are included in the sale. ---Please note that due to the nature of this item, it is sold as seen as we don't have the parts or expertise to fully test every element of this piece. ---As mentioned above, sold as seen - no warranty with this item. ---This is item is pickup only and will not be shipped out. ---If you have any questions about this item, please don't hesitate to get in touch. Can draw up to 320 x 220 mm in size. 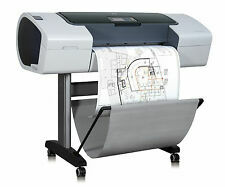 HP DESIGN JET T1100 wide format, large format printer / plotter. Plotter powers up & in working order. 2500mW EleksMaker EleksDraw. - EleksMaker EleksDraw DIY mini 2 axis drawing robot machine. - 1 x EleksDraw Drawing Machine (Unassembled). - With 2500mW powerful laser module. - 1 x 2500mW Laser Module.